Map is showing Afghanistan with surrounding countries, international borders, the national capital Kabul, provincial capitals, major cities, main roads, railroads and major airports. 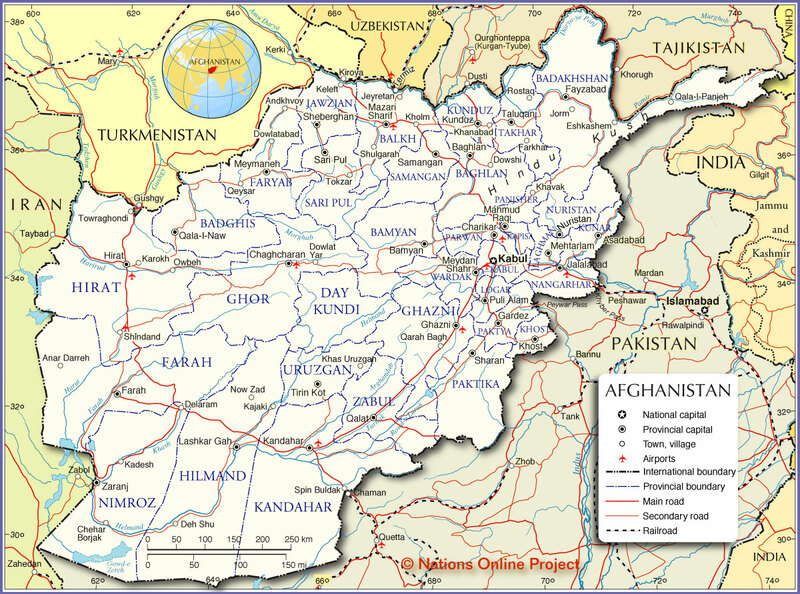 Afghanistan, a mountainous landlocked republic in Central Asia is bordered by Tajikistan, Turkmenistan, and Uzbekistan to the north, Iran in west, Pakistan in east and south and it has a small stretch of border in north east with both China and India (disputed because in Pakistan occupied Kashmir). With an area of about 652,000 km² it is slightly more than twice the size of Norway, or slightly smaller than the U.S. state Texas. Mountains dominate the central and eastern part of Afghanistan, covering about three-fourths of the country. The huge Hindu Kush mountain range stretches from the northeast to the southwest, where it extends into the Koh-i-Baba mountain range, the origin of all three of Afghanistan’s major river systems, the Kabul, the Hilmand-Arghandab, and the Hari River. In the northeastern outskirts the Hindu Kush range borders with the plateau of Pamir, and the range of Karakorum. Highest peak of the Hindu Kush in Afghanistan is Noshaq mountain (7,492 m). Deserts cover the southern and western parts of the country. A loess plateau, sloping towards the north, covers the northern part of the country; it borders with the outskirts of the vast Karakum Desert where the lowest point of Afghanistan (259m) is situated. The sources of most rivers lie in the mountains. The level of water in the rivers oscillates greatly. The highest level is in spring and early summer. In the remaining seasons the rivers may change into small streams or entirely disappear. The largest river flowing from the spring to the mouth of Afghanistan’s territory is the Hilmand River. The border river in north the Amu Darya, formed by the confluence of the Pamir River and the the Vakhsh river, is the greatest and one of the most important rivers in Central Asia. Anar Darreh, Andkhvoy, Asadabad, Baghlan, Bamyan, Borjak, Chaghcharan, Charikar, Chehar, Deh Shu, Delaram, Dowlat Yar, Dowlatabad, Dowshi, Eshkashem, Farah (capital of Farah Province), Farkhar, Fayzabad, Gardez (capital of Paktia Province), Ghazni, Hirat (also Herat, capital of Herat province, third largest city in Afghanistan), Jalalabad (capital of Nangarhar province), Jeyretan, Jorm, Kabul (national capital), Kadesh, Kajaki, Kandahar (second largest city in Afghanistan, (pop. about 500,000), capital of Kandahar Province), Karokh, Keleft, Khanabad, Khas Uruzgan, Khavak, Kholm, Khost, Kunduz (pop. 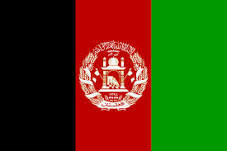 about 250,000, capital of Kunduz Province), Lashkar Gah (also called Bost ; capital of Helmand Province), Mahmud, Mazar i Sharif ( fourth-largest city in Afghanistan, pop. 375,000, capital of Balkh province), Mehtarlam, Meydan Shahr, Meymaneh, Now Zad, Nurstani, Owbeh-Shindand, Puli Alam, Puli Khumri (capital of Baghlan Province), Qala-I-Naw, Qala-I-Panjeh, Qalat (capital of Zabul Province), Qarah Bagh, Qeysar, Raqi, Rostaq, Samangan, Sari Pul, Sharan (capital town of Paktika province, altitude 2,200 m), Sheberghan, Shindand, Shulgarah, Spin Buldak, Taluqan (or Taloqan, capital of Takhar Province), Tirin Kot (also written Tarinkot, capital of Uruzgan province), Tokzar, Towraghondi, and Zaranj (capital of Nimruz province, serves as the border crossing between Afghanistan and Iran).